Kaeser is proud to present its highly successful «Premium Compact» range of reciprocating compressors. Each sporting a newly designed polyethylene (PE) sound enclosure, the four newest models provide compressed air power where it&apos;s needed, when it&apos;s needed. Portability is further enhanced thanks to the large carrying handle, a towing grip and two transport wheels. With displacements of 160 to 300 litres per minute and operating pressures of 10 or 20 bar, the new «Premium Compact» models offer exceptional flexibility. In fact they are the perfect work partners for a wide range of trade applications, sub-construction tasks and other similar fields of use. All models feature a convenient carrying handle, a towing grip and transport wheels to make transportation as simple as possible and are also impressively lightweight. But that&apos;s not all: Made from rotation-sintered polyethylene, the double-walled soundproof enclosure not only reduces compressor sound levels, but is also scratch and impact resistant. It therefore provides optimum protection against damage even in the toughest of work environments. Of course it is what lies beneath the enclosure that makes the real difference between these units and ordinary systems: A quality electric motor provides plenty of power, even with under-voltage caused by long extension power cables. Speaking of which, the unit&apos;s power cable can be wound on to the handy storage reel. The compressor&apos;s high quality cylinders are machined using a special finishing process to ensure maximum durability. This, combined with corrosion-resistant valves featuring stainless steel reeds and travel-limiters, makes for exceptional reliability, minimum maintenance requirement and long service life. 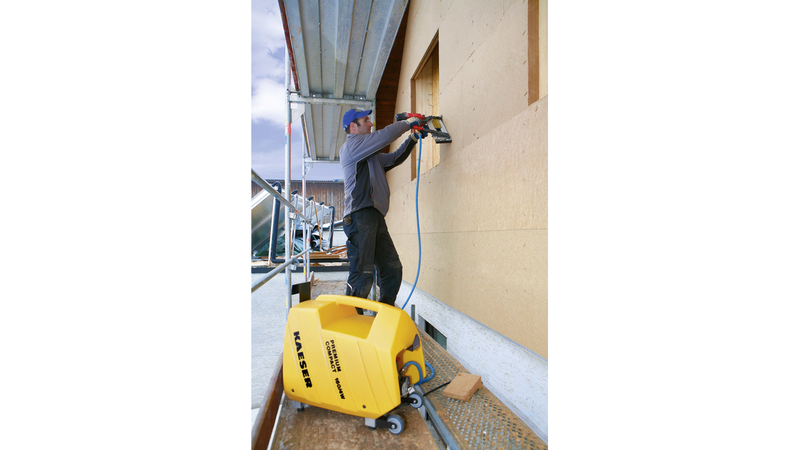 Compressed air storage is provided by a 4-litre compressed air receiver.